← SLAY THE AUDITION! Check Out ClarinetMike’s Performing Checklist! SUPER COOL POSTER for ClarinetMike In Italy 2018! Poster! Above is a poster I had made up to support my residency at Orfeo 2018. An easy-to-print copy of the poster is available on my clarinetmike.com website: CLICK HERE. I’ve also had some printed – if you want one, I’ll mail you one for free. Just drop me a note CLICK HERE. Perform! Below I’m performing at this past summer’s Orfeo Music Festival 2017 in Vipiteno, Italy. I’m performing Astor Piazzolla’s Oblivion with my fabulous colleague, Faina Lushtak, at the Chiesa di Santa Margherita in Vipiteno, Italy – an early Tyrolian Baroque church built in the 1670’s with an old bell tower first mentioned in 1337. 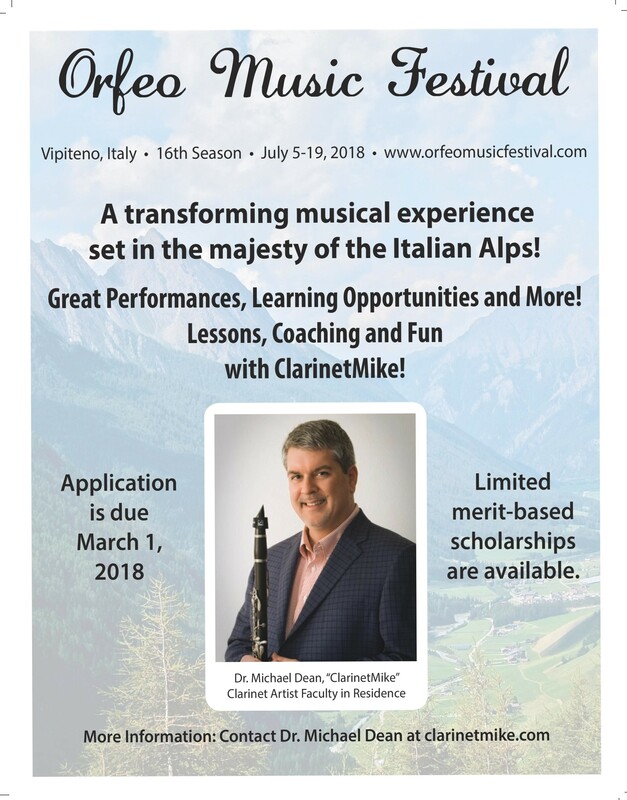 This entry was posted in All, News, Orfeo Music Festival, Performance & Pedagogy and tagged Clarinet, clarinet blog, Clarinet Clinic, Clarinet Conference, Clarinet Festivals, Clarinet Lessons, clarinet master class, clarinetmike, ClarinetMike Blog, ClarinetMike says, Italy, michael dean, Michael Dean clarinet, Music Festivals, Orfeo Music Festival, Skype, Skype Clarinet Lessons, Sterzing, Vipiteno Italy. Bookmark the permalink. 1 Response to SUPER COOL POSTER for ClarinetMike In Italy 2018!